Guest judge Boy George thrilled the designer contestants. 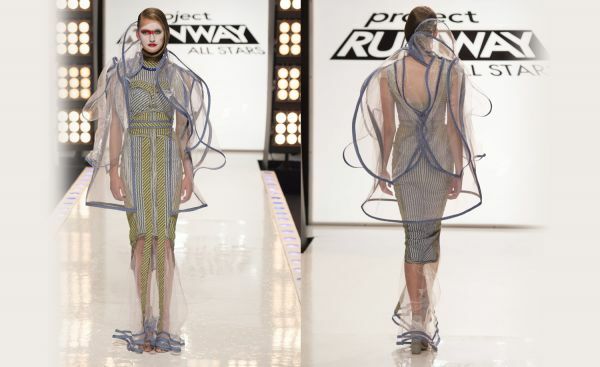 The five remaining contestants were tasked this week with creating “wearable art” with an avant-garde look. 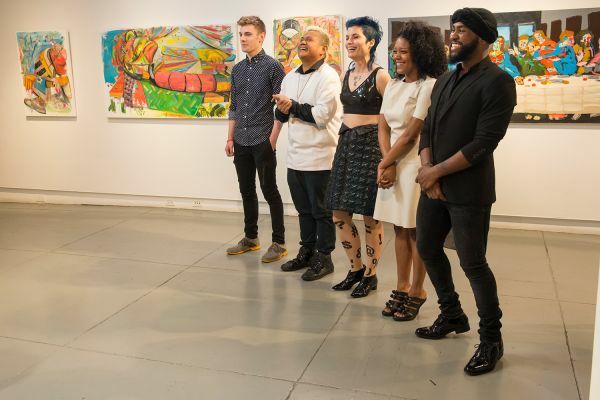 They got started at New York City’s Agora Gallery, where host Alyssa Milano instructed each designer to choose their favorite work of art on display. Then they met with the artist to discover the inspiration behind the artwork. All of the designers seemed genuinely excited by the challenge. They were given two whole days for the work, and each was given a budget of $400 to spend at Mood Designer Fabrics–the most generous they have been allowed thus far in the competition. 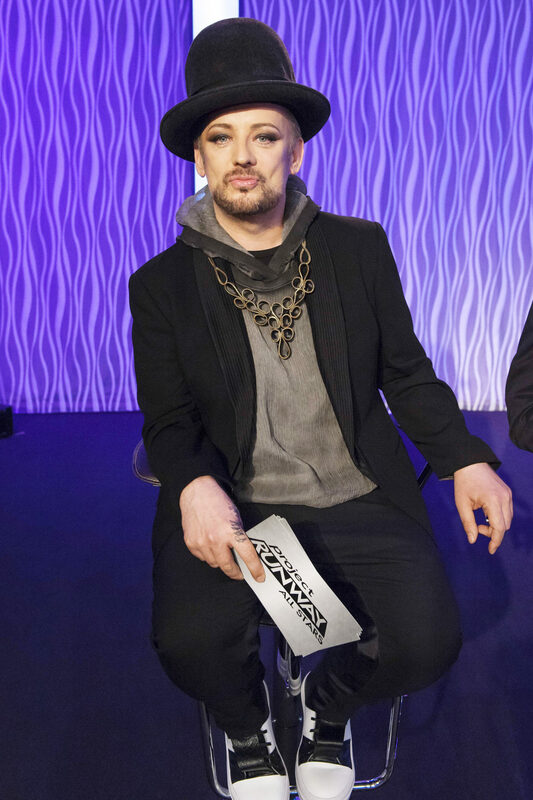 Contestants received one more surprise: This week’s guest judge would be British entertainer Boy George, currently a coach on The Voice UK. The designers’ reactions were priceless. Kini and Emily said they were inspired by Boy George when they were younger, so the idea of him judging their designs made them ecstatic. After the designers visited Mood and got back to the workroom, drama ensued. As soon as he saw Sam’s fabric and style choice, Ken made it clear he felt Sam was a mediocre designer. Draping and relying purely on fabric choice, he said, should not be enough to remain in the running for Project Runway’s next all-star. 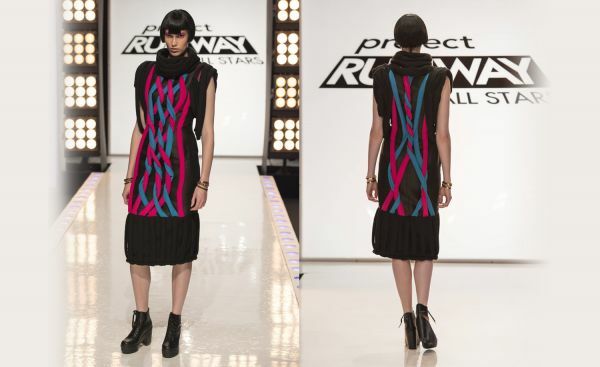 Project Runway can do without all the fighting and gossiping, but I agree with Ken and the rest of the contestants that Sam is just breezing through this competition, and it’s not because he is a gifted designer. His creations always fall flat, yet he appears to stay on the program for shock value. Ken is a powerful designer. I have found myself really liking his designs. He thinks outside the box, and that is what has propelled him in this competition. He has grown a lot since he first appeared on Project Runway, and it is exciting to watch. This piece, much like Kini’s, was concealing and mysterious. He did a great job and deserved to win this challenge. I look forward to seeing what he does in future weeks. Emily was a contestant I often overlooked. She was always in the safe group and never created anything truly memorable in my eyes. Still, I will miss her because, while she looked edgy and mean, she was one of the sweetest contestants. Even when talking about the unpopular Sam, she was upbeat by saying he was a good person. With this challenge, she repeatedly noted how proud she was of her design. Her design was not bad, it just was not avant-garde enough. Kini took a risk with this design. He created an almost “goth Barbie” look. Any other week, this would be atrocious, but in the avant-garde challenge it was a fascinating design. Throughout the episode, whenever Kini mentioned adding the black bodysuit, I would cringe. 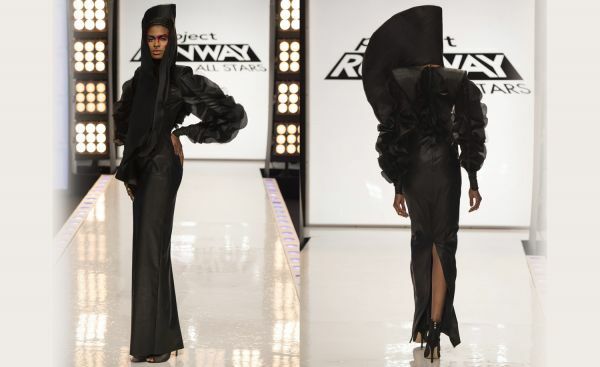 Once I saw it on the runway, I changed my mind. In fact, without the bodysuit, I don’t think the design would have had the same appeal. The black added a sense of mystery and anonymity. He was very creative with this piece, and he took his time. The end result reflected that. Dom created a breathtaking design. I enjoyed this body-con dress and wish that she could have won. Dom has shown her skills again and again, and she continues to surprise me in each episode. I definitely overlooked her in the beginning of the competition, but she does incredible things time after time. I cannot wait to see what she does next week. I am confused beyond words as to how Sam is still in this competition. This dress is literally just some fabric draped over itself. How is this acceptable this far into the competition? On top of the construction, his inspiration was also a bit off. The piece of artwork he chose to work from was an owl. I don’t see anything even remotely related to his selected artwork, from color scheme to interpretation. I don’t understand why he designed this dress. I am disappointed that the judges sent Emily home this week rather than Sam. I really hope the judges see that he is not all they think he is: He may have a good eye for fashion, but his designs are often shoddy. If Sam was any other designer, he would have been sent home by now. Do you agree with the judges sending Emily home? If not, who do you think it should have been? Leave a comment below letting us know, and don’t forget to tune into Project Runway All Stars at 9/8 central time on Lifetime. Contestant Kini works on his design. The judging panel was made up of guest Boy George, Isaac Mizrahi, and Georgina Chapman.